Lancaster III ED878 crashed in the North Sea 25/7 1943. The aircraft belonged to RAF 103 Sqn Bomber Command and was coded PM-V.
T/o 22:04 Elsham Wolds. OP: Hamburg. It is believed that this aircraft was attacked by Leutnant Gotthard Sachsenberg of 5./ NJG 3 while flying at 5800 metres and crashed into the North Sea 15 kilometres northwest of St. Peter Ording killing all onboard. Pilot W/O Felix F. O`Hanlon, Navigator Sgt George I. Baily, Air bomber Sgt Robert L. Perry and Air Gnr. Sgt James C. Hamilton has no know grave while Flt. Engr. Sgt Thomas E. Witts today rest in Hamburg Cemetery, Ohlsdorf, Germany. Air Gnr. 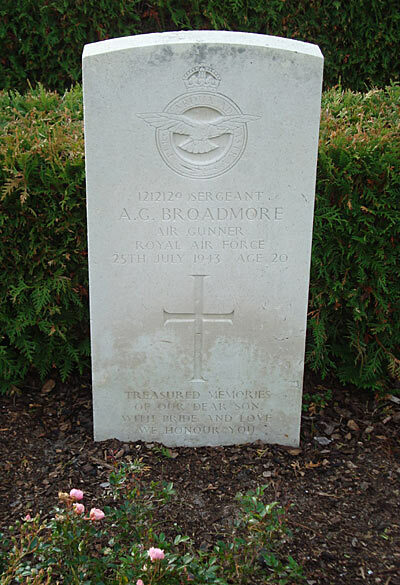 Sgt Alfred G. Broadmore was found washed ashore on the island of Rømø on 2/9 and was laid to rest in Kirkeby cemetery on 3/9 1943. Sources: BCL, CWGC, UA, KK, TW.